It is only three years since Tessa Gray lost her beloved husband William Herondale, and she is searching for a reason to live, trying to find the path of being a warlock with the guidance of her friend Catarina Loss. 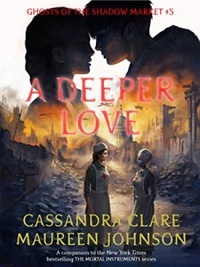 World War II rains down destruction on their world, and Tessa and Catarina become nurses who make bargains at the Shadow Market for enchantments to help suffering mundanes. But can Brother Zachariah bear to see the woman he loves risk her life, or might he consider breaking sacred vows to save her from loneliness?